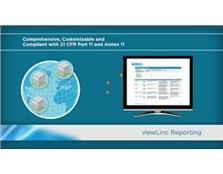 Vaisala viewLinc software is the core of the Continuous Monitoring System. The software provides remo​te monitoring, alarming, real-time trending, and regulatory-compliant records for your life science environments like cleanrooms, stability areas, warehouses and cold rooms. Vaisala viewLinc is one of the easiest monitoring systems to use, install and configure. It integrates wit​h your existing OPC-compatible network, meaning you save on the c​osts and hassle of installing and maintaining a dedicated network for a monitorin​g system.